Chief Carroll arrives at tower #1 just after the second tower, Building #2 was hit. He transverses across a section that has been set up with yellow tape by the FBI to keep the public from entering a crime scene. The area is full of debris from the plane and pieces of the building. The loss of life is evident as well. He turned around to gather his patrols. That is when he meets back up with Captain Keegan. As they stand together contemplating the fate of the towers, the north face of the south towers just explodes. Then a ball of fire flashes out and the building begins it's journey down towards the center of the earth. 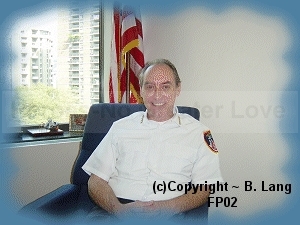 It is a miracle that the Chief is here TODAY having survived the collapses of both large towers.